1979-07-09. New. Ships with Tracking Number! INTERNATIONAL WORLDWIDE Shipping available. Buy with confidence, excellent customer service! 1992-04-03. New. Ships with Tracking Number! INTERNATIONAL WORLDWIDE Shipping available. Buy with confidence, excellent customer service! Lippincott. Hardcover. 0397013299 HC/DJ Stated First Edition - 9 8 7 6 5 4 3 2 1. DJ has light wear - few small tears, front flap is creased. Binding is good. Has not been price clipped - $12.95. Some light foxing to text block. . Good. Penguin Books, 1992-03-01. Paperback. Used:Good. Penguin Books. PAPERBACK. 0140158405 New Condition. . New. Lippincott. Hardcover. 0397013299 New Condition. . New. 1992-04-03. Good. Ships with Tracking Number! INTERNATIONAL WORLDWIDE Shipping available. May not contain Access Codes or Supplements. May be ex-library. Shipping & Handling by region. Buy with confidence, excellent customer service! 1979-07-09. Good. Ships with Tracking Number! INTERNATIONAL WORLDWIDE Shipping available. May not contain Access Codes or Supplements. May be ex-library. Shipping & Handling by region. Buy with confidence, excellent customer service! Lippincott. Hardcover. 0397013299 Like New Condition. . Fine. Paperback. New. 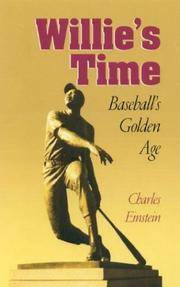 This 25th anniversary edition restores to print Charles Einstein's biography of one of baseball's legends. With a new preface from the author, this volume replays dramatic moments of the Say Hey Kid's career - from the 1951 Miracle Giants to the Amazing Mets of 1973 - and takes us inside the lives of Ruth, DiMaggio, Aaron, Durocher, and others. Penguin Books. PAPERBACK. 0140158405 Like New Condition. . Fine. Lippincott. Very Good+ in Very Good+ dust jacket. 1979. First Edition; First Printing. Hardcover. 0397013299 . Clean and tight, with no signs of any prior use or wear. There is slight fading to the cloth spine, although the jacket conceals this. The jacket is intact, with only a touch of wear. A mylar Brodart cover now protects it. This looks like a deeply interesting book. Fast shipping, with tracking number provided. ; 9 X 6.30 X 1.30 inches; 352 pages . Southern Illinois University Press. Used - Very Good. Great condition for a used book! Minimal wear. Southern Illinois University Press. Used - Good. Former Library book. Shows some signs of wear, and may have some markings on the inside. Southern Illinois University Press. Used - Good. Ships from Reno, NV. Shows some signs of wear, and may have some markings on the inside. 100% Money Back Guarantee. Shipped to over one million happy customers. Your purchase benefits world literacy! Southern Illinois University Press. Used - Very Good. Ships from Reno, NV. Former Library book. Great condition for a used book! Minimal wear. 100% Money Back Guarantee. Shipped to over one million happy customers. Your purchase benefits world literacy! New York: J.B. Lippincott. Good+ with no dust jacket. 1979. First Edition. Hardcover. VG/ minor wear on edges of dj; 8 vo. .
Berkley. Good. 1980. Paperback. 0425046583 . Clean text, cover has scuffing. Not just a sports book, but a "blend of history, trivia, sports lore and anecdote"; ; . Penguin (Non-Classics), 1992-03-01. Paperback. Good. Lippincott. Hardcover. 0397013299 1979; Stated First Edition; red paper over boards with black cloth spine; in illustrated dust jacket; some edge wear to jacket with a few tears; price clipped off flap; book is cocked; interior is clean; 352 pages; 8vo - over 7 3/4" - 9 3/4" Tall . Good. Southern Illinois University Press, 2004-02-20. Paperback. Very Good. Nice copy with light cover wear. Pages clean with tight binding. Lippincott. Hardcover. 0397013299 Item in acceptable condition! Textbooks may not include supplemental items i.e. CDs, access codes etc... . Fair. Penguin Books. Used - Good. Shows some signs of wear, and may have some markings on the inside. Berkley. Used - Acceptable. Acceptable condition. E Rutherford, New Jersey, U.S.A.: Berkley Pub Group, 1980. A very good photo picture cover paperback. Copyright 1979..
Berkley. MASS MARKET PAPERBACK. 0425046583 1980 Berkley; PB; Cover: shelf & edge wears, minor page grime/tanning, slight edge curl, o/w great condition; Fore-edge: minor age grime/tanning; Spine: creases; Content: bookstore mark, page tanning, o/w clean, tight & unmarked; Ships Quick . Very Good. Berkley. MASS MARKET PAPERBACK. 0425046583 Berkley paperback; no writing or tears; s . Very Good. Penquin, 0000. Trade Paperback. Good. Lippincott, 1/1/1979. Hardcover. Acceptable. 1.3000 inches 9.0000 inches 6.3000 inches. Missing dust jacket. Scuff marks on cover. Penguin Books. PAPERBACK. 0140158405 Very Good Condition. Tight and Neat. Five star seller - Buy with confidence! . Very Good. Southern Illinois University Press. PAPERBACK. 080932573X Very Good Condition. Tight and Neat. Five star seller - Buy with confidence! . Very Good.